Offering a stunning array of performance, efficiency and reliability, Panasonic’s KV-S4085CW mid-volume production scanner is optimized for deployment in organizations with extremely heavy volumes of paperwork requiring exceedingly fast performance. With the ability to scan virtually any type of document, from business cards to ledger size paper, the KV-S4085CW is an essential solution for any organization with a constant flow of scanning. Beyond standard documents, the KV-S4085CW also features the ability to scan continuous documents of up to 100″ in length such as EKG reports or well logs. With available ToughFeed technology, it utilizes ultrasonic double-feed sensors and staple detection to safeguard against any disruptions to the scan process. The KV-S4085CW’s extensive hardware elements are further maximized by a range of available software options. With the ability to purchase the unit bundled with either Panasonic’s powerful “Image Capture Plus” or Kofax’s advanced “VRS Elite Production”, the scanner will handle precision document reproduction and versatile image processing with ease. Featuring a sturdy, dependable construction and a rugged and durable design, the KV-S4085CW fits comfortably into any high-volume scanning environment. Whether it’s scanning a single page or a full stack of documents, the KV-S4085CW provides you with an exceptionally powerful and robust scanning solution. The ability to handle “Mixed Size Document Feeding” is an essential feature for any situation in which the scanner user may encounter the need to scan a multitude of different sized documents. This helps save time by feeding documents of varied sizes at the same time, from business cards to the maximum document size, without the hassle of having to continuously stop the scanning process to adjust settings or guiderails. 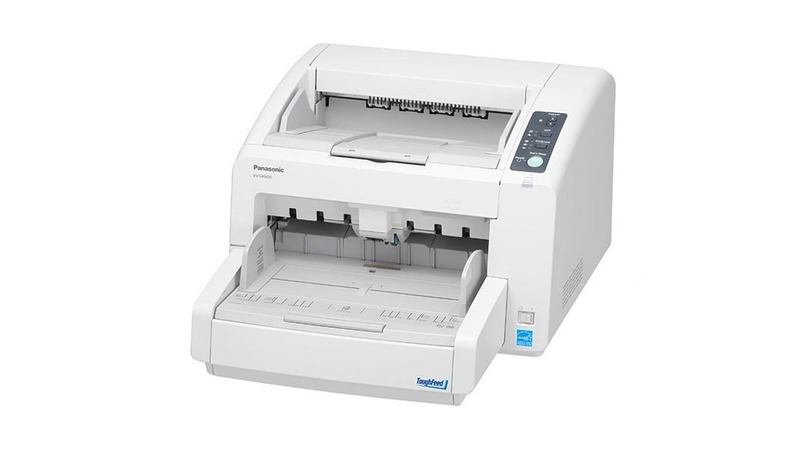 To prevent documents with staples from going through the scanner and damaging the scanning glass, “Stapled Document Detection” uses a sensor to detect various types of stapled documents and immediately stops the scanner when they are detected. This minimizes damage to both the document and the scanning glass, and keeps your scanning glass in excellent condition. Ensuring accurate document feeding, “Intelligent Feed Control” checks the condition of the paper feed and automatically adjusts roller pressure and the ADF tray to ensure that documents of various thicknesses are accurately fed. This makes document feeding more reliable and accurate than conventional methods that only use a basic feed mechanism. Ensuring reliable scanning of large amounts of documents, the “Double-Feed Prevention Roller” helps prevent scanning mis-feeds. Assisting the document feeding process, the double-feed prevention roller separates the feeding documents from the second sheet onward. This reduces, and ultimately helps to prevent the number of occurrences of sheets coming through as a double-feed. With the “Imprinter Option Available”, this separately sold scanner accessory can be mounted to the scanner and used to print a string of characters on documents. The imprinter is beneficial in helping to raise filing efficiency and reliability, as well as ensuring that documents are processed correctly post scanning. To create the very best possible image, this scanner incorporates “Advanced Hybrid Scanning Technology”. This combines a CIS (Contact Image Sensor) along with CCD (Charge-Coupled Device) to create a scanner with high-precision scanning technology. This hybrid system, coupled with a highly-luminous LED lamp, enables higher quality image scanning and provides the best possible image output. To provide scanner users with the most versatile scanning environments, the user has the choice to utilize a “Curved or Straight Paper Path”. While the typical output via the curved path outputs to an output tray at the front of the unit, the user can choose to utilize a straight path which outputs straight through to the rear of the unit. The choice to utilize the straight paper path ensures high reliability with thick or long paper. The possibilities for both usage and installation location are almost unlimited as a result of this feature. Increasing the capabilities of scanners, “Thin Paper Scanning” allows scanner users to continuously scan documents as thin as 0.00157 inches (0.04mm). This makes it easy to scan thin forms, vouchers and carbon paper, while also increasing the number of situations where you can scan without having to worry about whether your documents will properly scan. Bundled standard with all Panasonic Scanners, the Panasonic Image Capture Plus Software is your ultimate capture solution. Featuring a wealth of image processing functionality, it ensures that you have the tools necessary to handle virtually any scanning requirement. Features of the Panasonic Image Capture Plus software include: Automatic Brightness Adjustment, Automatic Image Emphasis, Zonal OCR, Automatic Binary/Colour Distinction, Double Exposure, Blank Page Removal, Automatic Crop, Automatic Deskew, MultiStream, Dynamic Threshold, Multi-Colour Dropout, Hole Removal, Background Smoothing, 2-Page Separation, Multi-Crop, and more. For environments where the Kofax® Virtual Rescan Elite Software is required, Panasonic also offers the Panasonic KV-S4085CW scanner bundled with the Kofax® VRS software. Panasonic scanners that include the VRS software bundle are designated with a (-V) at the end of the model number. The Kofax® VRS Elite software provides a variety of advanced scanner applications such as: Device Health Monitor, Centralized Licensing, Profiles and Customizable User Interface, and more.